As I mentioned in the end of my last post I'm currently in Finale Ligure on the North-West Italian coast. I had heard from friends that the climbing here was good and it was kind of on route from Dolomites/Arco to Ceuse. The guidebook for the area (Andrea Gallo 2007 Italian with German and English text) is a real tomb, it's got over 2000 routes in it! Finalborgo the old part of Finale town is a beautiful historic old walled Italian town complete with narrow pedestrianised cobbled streets, a castle and of course fantastic pizza, coffee and gelateria (ice cream)! 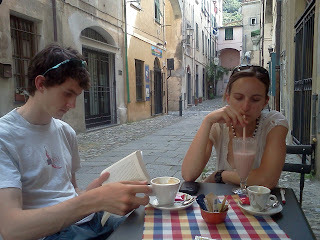 I can recommend the Castello pizzeria, Bar Central for ice cream and Sbuccia cafe for coffee, smoothie and fast free wifi. The new part of the town Finale Marina has got beaches and the usual seaside antics: difficult parking and sun burnt holiday goer's. Almost all the crags are nestled up in the densely wooded and wildly vegetated hills above the town, finding the crag and the correct sector can take a bit of trial and error. For the first few night we stayed up in Case Valle, from here we could walk down into town and access about nine different crags. Unfortunately most of the crags faced south and climbing became unbearably hot after mid-morning. This time of year (June) the temperature is mostly around 30 degrees C, dropping down to low 20's in the night. Climbing in the shade is ok, as long as there's a breeze. The guidebook recommends the best time to visit is Easter and October time although climbing could easily happen all winter. The highlight of the crags we visited in the Case Valle was Grotta Dell 'Edera. This was an open-air cylindrical climbing arena accessible via a underground cave! It's not only an amazing situation, the climbing was also fantastic; steep tufa lines and intricate wall climbing on deep pockets. I climbed Per Uscire Dalle Tenebre 6c+ and Lubna 7b, both were fantastic. Don't take my word for it, check out the photos! After a rest day catching up on work and wifi in an awesome little back street cafe in town we moved camp over to Monte Cucco where I had heard there was a free campsite and NW facing crags. The free campsite turned out to be an old abandoned campsite which is now open to all. On the first evening I managed to sweat my way up a silly steep and spicily bolted 6c in 29 degree C perfectly still muggy air. The next day conditions were much better, a nice cool breeze made for enjoyable climbing, We headed over to sector Fenia o Anfiteatro which turned out to be a stunning 40m ish slightly overhanging limestone wall, splattered with deep pockets. Chris and I climbed Zambrink 6c, Cianbalaur 7a, Megahommu 7a+/b and Belin Double 7b. All were 30m+ of steep pocket pulling enjoyment. The guidebook seemed to suggest that the grading at Finale was on the tough side due to the latter adoption of the french grades, I would say this is true on the easier routes (6c and below), we though the routes given 7a and above were more correctly graded, presumably since they were put up later. Although maybe still not holiday ticks! Now for a rest day before heading to Ceuse at the weekend. I'm looking forward to being back in France and my first ever visit to the 'best crag in the world'!